91.7 FM WNJR Washington / Pittsburgh : WNJR.org: Involvement Expo 2017! Still looking for your place on campus? Thinking about joining more clubs, but not sure where to start? Look no further! This Wednesday, September 6th, is the involvement expo, where more than 80 groups will have tables set up, and representatives for you to talk to. At the expo, you can connect with other students, community members, clubs, and local businesses. This is a great event where you can learn about all the different ways you can get involved on campus, and meet new people. Also, WNJR is DJing the event, so you'll be able to hear some great music the whole time! 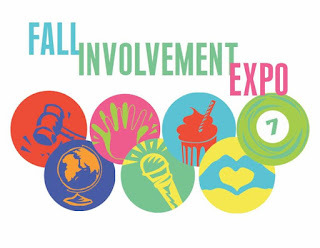 The involvement expo starts at 5pm and goes until 7pm and is going to be on the Rossin Patio, if there is inclement weather, it will be moved to the Rossin Ballroom.